March 2, Happy Birthday Dr. Seuss! His books are scattered all over our house. We will be celebrating by reading several of his books, playing games and munching on Seuss style snacks. I'm excited to share several activities and snacks with my son's kindergarten class in the morning. "Fill your house with stacks of books...in all the crannies and all the nooks." This quote is from the movie, In Search of Dr. Seuss. Dr. Seuss knew the average kid would pick up a book and be hooked. It has been the inspiration for my blog. I really want children to be surrounded by books at home. We have well over 1,000 books. I am constantly trying to sort through them and share with others. We donate many to the Burmese refugee children we work with in Salt Lake. We've held book drives to collect and donate more books for them. My children love helping pass out the books. This is one reason I haven't been blogging as much in the last year. I've been "in the trenches" trying to spread literacy instead of behind my computer blogging as much. I still share quick ideas and activities on Instagram but I don't have the time to share more details on my blog for now. I'm also our school PTA president this year. I'm currently helping with our readathon which has been a Dr. Seuss theme the past five years. This year we have a new mascot so we are doing a fantasy reading theme. I'm helping plan a medieval festival to celebrate all the extra reading our students do. I hope you all are reading more with your children or classroom. 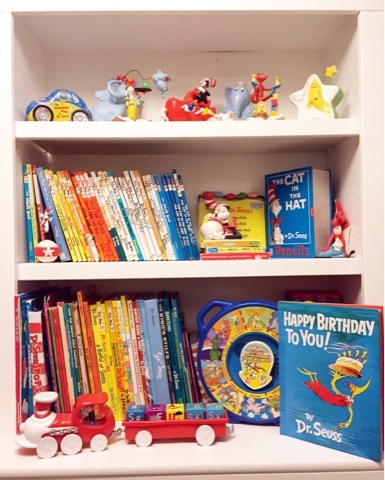 Share a Dr. Seuss book today to celebrate his birthday. Start filling your house with stacks of books. We buy books at yard sales, thrift shops, local books stores and online through Amazon and Barnes and Noble. We love to give and receive books as gifts. We've also done a book exchange at church where we have a cupboard we bring a book to leave and take a book to keep. I'm also excited to start working on building my own Dr. Seuss Little Free Library house for my yard this summer. If you don't like books taking up a lot of space at your home long term, make sure to rotate books from your local library. Sometimes owning too many books can be overwhelming and my kids get used to seeing them and aren't as interested in reading them. A new stack of books borrowed from the library gets them excited. Whatever method you choose, just make sure to keep books accessible for children. Help them find books they are interested in and get them excited about reading! I'd love to know how you're celebrating Dr. Seuss' birthday. Leave a comment below or leave a link to your blog if you've shared ideas online. Follow me on Instagram (@reading_refuge) and Facebook: obSEUSSed.